Cable Ties hold down wire bundles and cables. Kwik Wrap has cross on head that allows ties to be permanently mounted with screw or rivet. White labeling area allows bundles and cables to be identified. Wraps are made from industrial hook and loop materials, are releasable and reusable, and will not allow over-cinching of material. Ties are suitable for bundling fiber optic cables. LED Holder snaps directly into panel. 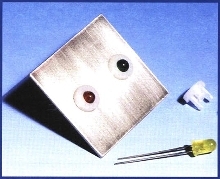 Model LEDHPM-1 holds T-1 3/4 LED securely while it snaps into board or panel. Part snaps into 0.281 to 0.287 in. diameter hole in panel 0.044 to 0.048 in. thick. Snap-in fingers for panel hold LED in place, so no extra retaining rings are required. Board Stackers offer design flexibility. Grippers provide high grip force to weight ratio. GRS Grippers, available in 5 sizes with 2 jaw travels per size, have hardened jaws and hardcoated bearing surfaces. Internal jaw seals resist contaminants. Tooling alignment is achieved through use of dowel pin holes in jaws and body of gripper. GRS grippers feature angled cam drive and parallel jaw motion. 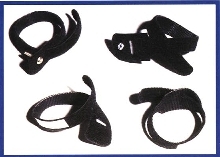 They are double acting for use in both internal and external gripping applications. Interconnects are available with 10 to 100 I/Os. 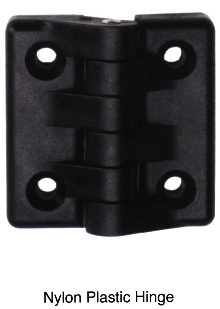 Nylon Plastic Hinges can replace steel hinges. Available in countersunk thru hole, tapped insert, or threaded stud versions, these hinges can be substituted for metal hinges. Constructed from reinforced nylon plastic with black matte finish, they have stainless steel hinge pins. Tapped insert is made from brass, and threaded stud is steel and zinc-plated. Both are molded in. 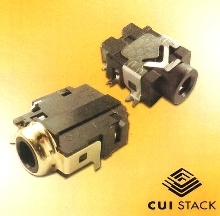 Audio Jacks are available with 4, 5 or 6 conductors. Suitable for portable devices, information technology applications, and small products requiring additional signals for sensing or control, these audio jacks provide additional conductors in small package size. Both 2.5mm and 3.5mm input sizes are available in thru-hole and surface mount options. 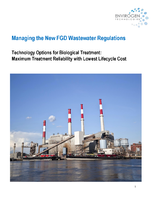 All have minimum life of 5,000 cycles and are made from UL94VO materials. 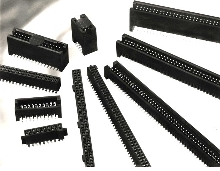 Shielded Connector minimizes electrical interference. Milling Cutters work fast and efficiently. Fix-Perfect aluminum milling cutter inserts have on-edge orientation and 34 deg positive rake angle. This geometry reduces insert edge buildup, improves tool life, and provides free cutting action that makes it possible to machine thin-walled parts. 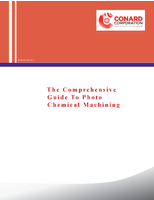 Inserts are available in uncoated, coated, and polycrystalline diamond versions. 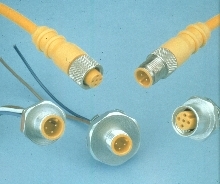 Connectors allow for off-axis insertion. Triad Magnetics, an industry leader and one of the most trusted names in transformer design and manufacturing, is proud to announce the release of the Triad WAU Wall Plug-In AC Power Supply. 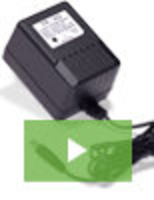 Engineered to provide robust performance and high reliability, it is setting the standard for 120V/60Hz power supplies. See our video to learn all about it.